Fujitsu today announced that it has set up an environment at the FUJITSU Digital Transformation Center (DTC), a co-creative workshop space for digital transformation in Minato-ku, Tokyo, for testing IoT systems that combine IoT-related products and services from Fujitsu and its partner companies. Starting today, customers and application-development vendors can run connectivity tests on their applications, easily and at no cost, using the IoT Testing Environment, with the additional benefit of specialist support from Fujitsu's engineers. Users of the test environment can quickly verify the compatibility of their applications with IoT systems, helping them to speed creation of comprehensive IoT solutions that extend from sensor devices to applications. 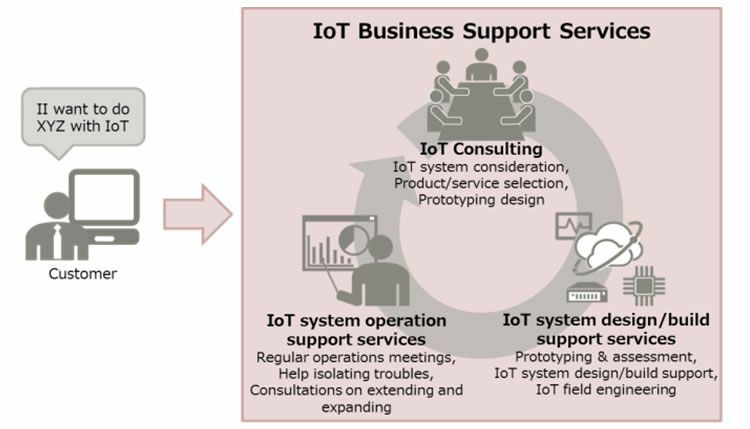 Fujitsu has also today made available FUJITSU IoT Solution IoT Business Support Services to provide integrated support for the processes of planning, prototype testing, and then designing, building, and operating multivendor IoT systems. As Fujitsu strengthens its own IoT-related products and services, it is accelerating co-creation with its partner companies to help customers using IoT solve their problems and become more competitive. Opportunities to use IoT are increasing in a number of fields, such as manufacturing and distribution, but many companies have not taken the first step, saying "we'd like to use IoT, but we don't know where to start," or "we'd like to try it, but we don't have a clear picture of what that would look like." So, starting in May 2016, Fujitsu began organizing IoT co-creation workshops using design approach methods at the DTC, to help companies conceptualize ways to expand their businesses or streamline their operational processes through the IoT, and to carry out the measures needed to turn those concepts into reality. Fujitsu conducts these workshops for companies that have already decided on goals for IoT, to help them achieve their goals more quickly, and provides integrated support services for planning, deploying, and operating total IoT solutions, which include everything from sensor devices to applications. 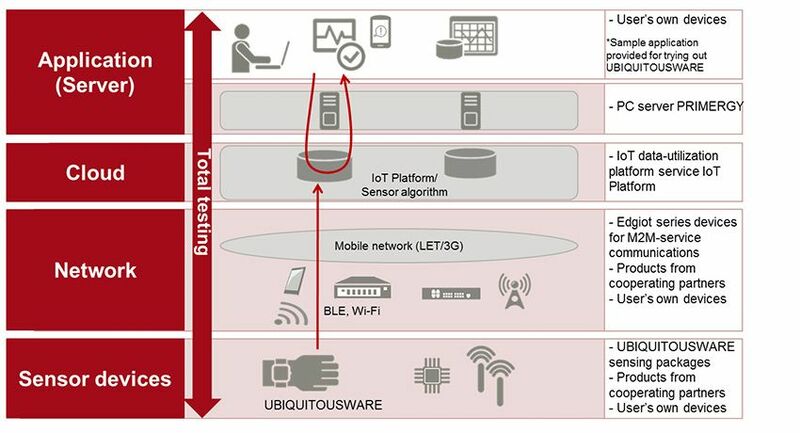 The IoT Testing Environment at the DTC provides a no-cost environment for testing IoT systems built using FUJITSU Cloud Service IoT Platform (Fujitsu's IoT data-utilization platform service), FUJITSU IoT Solution UBIQUITOUSWARE (Fujitsu's Internet-of-Things package which includes various sensor devices and sensor algorithms for converting sensor data to valuable information), and sensor devices from partner companies approved by the IoT Platform Ready Program(1) to confirm stable connectivity. Customers and partner companies developing applications for the IoT can use this environment to test connectivity to prototype systems using real-world hardware without needing to provide their own cloud or network environment, or sensor devices. This enables them to quickly develop and deploy total IoT solutions that cover everything from sensor devices to applications. IoT Business Support Services build on the knowledge and know-how Fujitsu has accumulated by developing numerous IoT systems. It provides customers seeking to use IoT to develop new lines of business or to make their operational processes more efficient with integrated support for the processes of planning, prototype testing, and then designing, building, and operating multivendor IoT systems. IoT Business Support Services are offered in three phases to meet different customer needs. Fujitsu will work with customers to consider and select the cloud environment, network environment, and sensor devices that best suit the customer's intended IoT system, and propose a total solution. The proposal covers everything up to designing a prototype system which includes IoT-related products and services from partner companies, such as IoT Platform Ready Program approved sensor devices from partner companies, and applications confirmed to connect reliably in the IoT Testing Environment. Fujitsu will build a prototype system and conduct operational testing in a short time. After testing, Fujitsu will assist with designing and building the actual IoT system while taking into account connections to the customer's existing systems. When building an IoT system, factors that tend to draw out the build process are radio-frequency congestion or interference. Using proprietary technology developed by Fujitsu Laboratories to visualize radio interference(2) , Fujitsu supports with the proper installation of wireless equipment to the deployment site, helping to deploy the IoT system more quickly. After deployment, Fujitsu will analyze the IoT system's operational status and propose improvements. The company can also assist with extending applicable IoT-related products and services, overseas expansion, and analyzing the causes of system troubles. Sales to 300 companies total by March 31, 2019. A program for approving products that have been confirmed to connect reliably to Fujitsu's IoT Platform. In addition to publishing product information about approved products, Fujitsu actively uses those products when built IoT systems for customers.